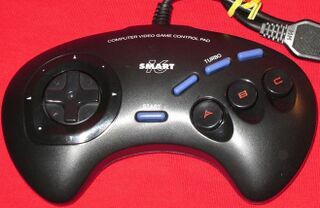 The Smart 16 is a third party control pad released in the early 1990s by Honey Bee. It was distributed under the Competition Pro brand in the western world and renamed the Professional Control Pad Series II (following the Professional Control Pad (actually the Mega Pad by ASCII)). Honey Bee also released this as the Mega Pad (SG-8) and Super Power Pad (SG-3) - these models have a slightly different design but are thought to be functionally identical. Mega Pads were released by Doc's in the US under the Replace-a-Pad range. The Smart 16 is a simple three button controller with turbo features, not too dissimilar from an official control pad. In the west it would be followed by the Professional Control Pad Series III.